The much awaited inner ring road will finally be open for public. 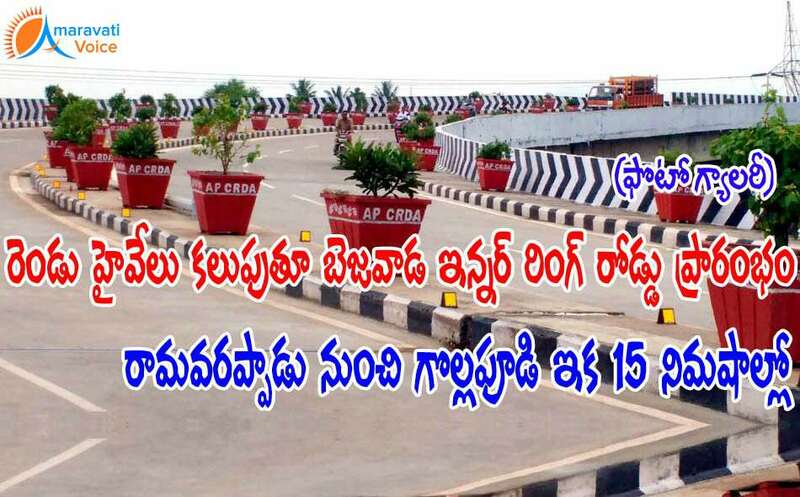 Chief Minister Chandrababu Naidu will inaugurate the inner ring road today. The two highways would be connected with this, from Ramavarappadu to Gollapudi. With this the vehicles need not to enter the city to reach Hyderabad or Vizag. This would also be helpful to the upcoming pushkar traffic. Vehicles travelling from Hyderabad to Vizag will be diverted at Gollapudi and will pass via Nynavaram bridge at Milk Project, Ajit Singh Nagar, Gunadala and finally reach Ramavarappadu Junction by crossing two flyover bridges. Ramavappadu Junction connects Chennai-Kolkata Highway and Chennai-Hyderabad highway. Vehicles coming from Chennai to Hyderabad can pass via Ramavarappadu, IRR and finally reach Gollapudi without entering the old city. The inner ring road was completed at a cost or Rs.119 crore. The center lighting and the greenery on either side of the roads and on the divider is attracting the public. As long as no change in the vehicle drivers to keeping left is mandatory and to follow the MV Act and Rules the traffic hazards shall continue ,how many Flyivers and IRR errected, as a fact trained police Vehicle,RTC vehicle and Transport Department vehicle drives doesn't know the road manners.